Insurance News Best Re has moved its headquarters to Labuan. It has 2 new entities there providing general reinsurance and family re-takaful business respectively. The gross written premium is expected to reach US$350 mil this year. Best Re plans RM480 million investment in two new entities that will provide general reinsurance and family re-takaful business. Insurance News Great Eastern Takaful targets RM180 mil AP in 1st year of operations. The company launched its takaful product lineup today, almost 1 month ahead of the original target of Jan 2011 and is the 1st out of the 4 new takaful licensees to do so. KUALA LUMPUR: Great Eastern Holdings Ltd expects RM1 billion in contributions by 2015 from its new takaful business via its new joint venture company, Great Eastern Takaful Sdn Bhd. Insurance News Great Eastern Takaful will use distribution channel of OCBC Al-Amin and also leverage on KAT's 140,000 members and probably recruit soldiers who opt for early retirement to become their agents. 2 new products were launched: I-Idaman and I-Abadi, focusing on protection and investment respectively. NEWLY-FORMED Great Eastern Takaful Sdn Bhd has set a target to win more than RM1 billion in premiums by 2015 by focusing on Malaysia and regional countries like Singapore and Indonesia. Insurance News Pacific Insurance will be sold to Fairfax for RM201 mil in cash, plus incremental NTA from 31 Dec 2008. The price represents 1.68 times NTA at 31/12/2008. The deal is expected to complete by March 2011. As a comparison, RHB Insurance was valued at 1.85 times book value while Jerneh Insurance was priced at 1.07 times. PETALING JAYA: PacificMas Bhd has signed a share sale agreement to sell its entire equity interest in The Pacific Insurance Bhd (PIB) to Fairfax Asia Ltd.
Insurance News Prudential has set itself targets of doubling 2009 value of its Asian life and asset management pre-tax operating profit and doubling its 2009 Asian premiums. 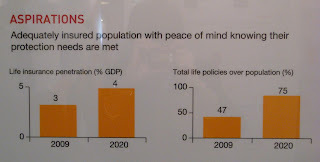 Both targets to be achieved in year 2013. LONDON: The boss of Britain’s biggest insurer Prudential Plc has outlined a plan to double Asian premiums by 2013, a move seen as bolstering his grip on the top job after a bungled takeover in the high-growth region. 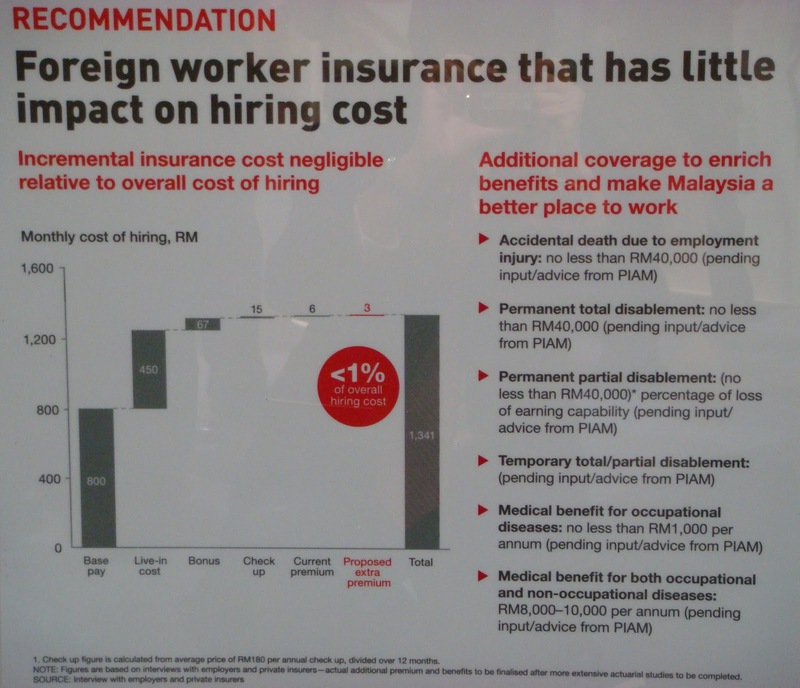 Insurance News The Malaysian Association of Suppliers and Managers of Foreign Workers said that the insurance companies will be making a clean profit of more than 90% on the Foreign Worker Health Insurance Scheme. The allegation is totally lack of common sense! 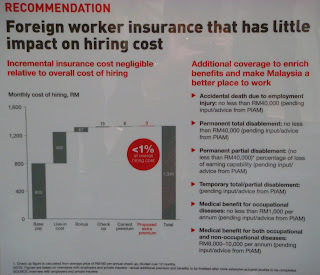 KUALA LUMPUR: The directive requiring all foreign workers except domestic maids to have health insurance will only benefit insurance companies, said the Malaysian Association of Suppliers and Managers of Foreign Workers. Insurance News MAA has not reached agreement with potential buyers of its general insurance business because it is holding out for more than RM300 mil. The price previously negotiated with AmG Insurance was RM274.8 mil. MAA has until August 2011 to raise capital to meet CAR requirement. MAA Holdings Bhd (1198) has yet to sell its general insurance business arm to AmBank Group because it is holding out for more than RM300 million. Insurance News Kurnia delivered a weak quarterly results with lower underwriting surplus before expenses and higher management expenses. KUALA LUMPUR: KURNIA ASIA BHD swung into the red with net losses of RM3.74 million in the quarter ended Sept 30, 2010 as it was impacted by higher management expenses while there was an underwriting deficit. Insurance News The Malaysia Deposit Insurance Corporation Bill 2010 was tabled for 1st reading in Dewan Rakyat. 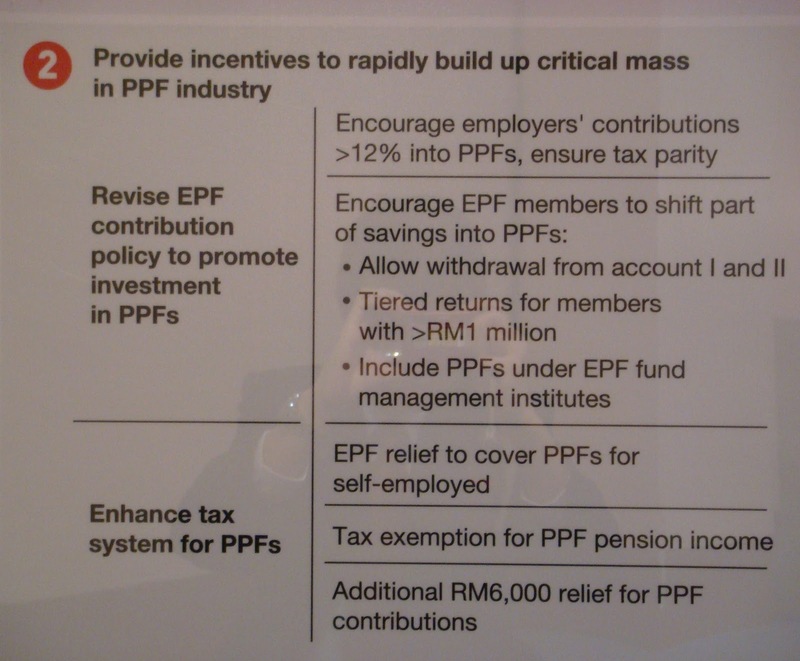 The bill will provide for the establishment of an explicit national takaful and insurance benefits protection system. KUALA LUMPUR: The Malaysia Deposit Insurance Corporation Bill 2010 was tabled for first reading in Dewan Rakyat on Tuesday, paving the way to increase the deposit insurance limit from the current RM60,000 to RM250,000 for next year. Insurance News MAA is considering raising more capital, either via rights or medium term note to meet the capital requirements by BNM. MAA is still in talks with various parties to sell its general insurance arm. KUALA LUMPUR: MAA HOLDINGS BHD is mulling over raising more capital to increase its buffer. Insurance News The government will speed up the review of TPBID scheme, after having had discussions with the insurance industry in August to September. The proposed mechanism will be presented to the government early next year after follow-up consultation with various interested parties. The average claim for private and commercial vehicles older than 10 years is about 17.5% higher than vehicles less than 10 years old. Insurance News Actuaries are good candidates for financial institution board and risk management committee members because they have a different way of thinking about risk, possess advanced risk analysis skills and have vast experience gained at board level. As a professional group. actuaries are also supported by strong standards to ensure the quality of their analysis and advice. The Institute of Actuaries of Australia (IAA) has called for more of its members to be included on the boards and risk management teams of insurance companies. 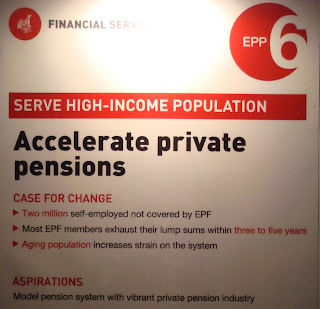 Insurance News The proposed private pension system will be voluntary. The development of the framework will be addressed in the 2nd Capital Market Masterplan targeted to be released before year-end. 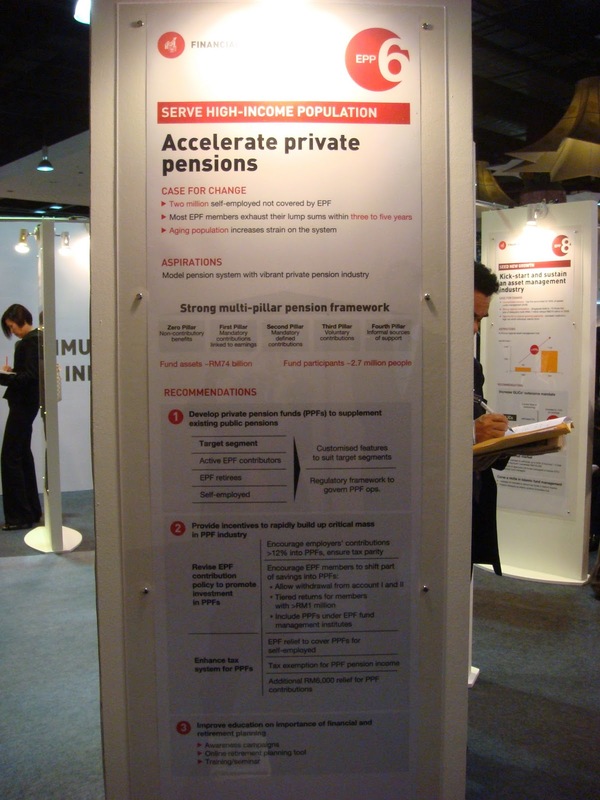 PETALING JAYA: The second Capital Market Masterplan (CMP2) for Malaysia from 2011 to 2020, which is expected to be released before year-end, will address key areas such as the development of a private pension fund framework, boosting retail participation in the local stock market, working capital improvement and higher attention to governance. Insurance News PruBSN launched a new product called PruBSN Ummah, a savings and protection plan that helps to defray the high cost of performing haj. Part of the savings can be withdrawn any time after the 5th certificate year. PruBSN has also partnered Amanah Raya Bhd to provide will writing services to participants of the plan. PRUDENTIAL BSN Takaful Bhd (PruBSN) expects significant contribution from its latest family takaful plan, PruBSN Ummah, after receiving positive response since its launch earlier this month. Insurance News In memory of Hemalatha Kasippillai, a staff of Hannover Re based in KL, who was unfortunately killed in Mumbai terror attacks 2 years ago. PETALING JAYA: Every Nov 27, S. Nishalini and S. Dhinesh say a silent prayer for their mother Hemalatha Kasippillai. 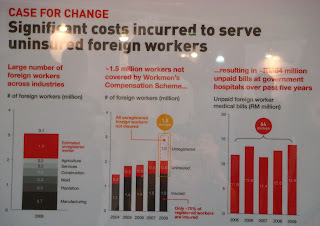 Insurance News The Foreign Worker Health Insurance scheme proposed under ETP will kick in on 1 Jan 2011. The annual premium is RM120, lower than RM200 previously announced. 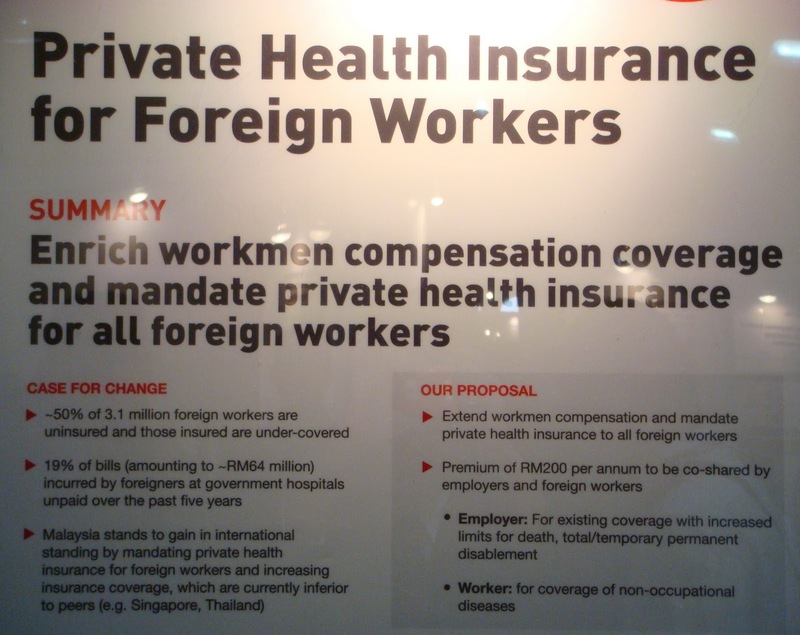 PUTRAJAYA: All foreign workers employed in Malaysia must be covered by medical insurance, in a Government ruling which will take effect on Jan 1 next year. Insurance News Christopher Wei, who recently quit as the Group Chief Marketing Officer of AIA, is joining Great Eastern as its new Group CEO effective 10 February 2011. Interestingly, the previous Group CEO of Great Eastern, Ng Keng Hooi, has actually crossed over to AIA. Christopher is an associate of the Casualty Actuarial Society. Insurance News HLTMT launched a new product "HLTMT i-Ihsan" and is expecting RM1 mil contributions in 6 months from the product. 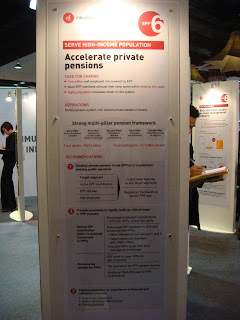 The product has high sum covered multiples and is targeted at lower income segment. HONG Leong Tokio Marine Takaful Bhd (HLTMT) wants to have more young customers, especially among those defined as Generation Y. Insurance News The AIA takaful JV is officially named AIA AFG Takaful Berhad. It targets to start operation in Q1 next year. KUALA LUMPUR: Alliance Financial Group Bhd’s subsidiary Alliance Bank Malaysia Bhd has entered into an agreement with American International Assurance Bhd (AIA) to set up a joint-venture company, AIA AFG Takaful Bhd. Insurance News The ING Takaful JV aims to be profitable in year 4 of operations; Great Eastern Takaful also previously set the same target. The ING JV aims to launch its first product in April 2011 and eventually will expand into Indonesia and Hong Kong. ING and Public Bank Bhd(PBB) new takaful firm aims to be profitable by its fourth year of business as it taps Malaysia’s underserved insurance market, and eventually expand into Indonesia and Hong Kong, its owners said today. Insurance News M&A of insurance companies often fails due to disagreement on price. Traditional valuation methods such as price earnings ratio and net asset value are not appropriate. Some recent failed M&As include P&O with Prudential, Tahan with Tokio Marine, Shriram, Fairfax and Allianz, Prudential with AIA. PETALING JAYA: The stake sale or takeover negotiations among insurance companies often come to nought as both parties are unable to agree on a price. Insurance News BNM has approved the sale of Pacific Insurance to Fairfax Asia. The details of the sale including the price has yet to be announced. PACIFICMAS Bhd said it has got the approval from the Minister of Finance through Bank Negara Malaysia to dispose its entire stake in The Pacific Insurance Bhd to Fairfax Asia Ltd.
Insurance News For insurance companies with both conventional and takaful licences, should they use the same agency to sell both products or should they have separate agency channels? Companies like Great Eastern, Prudential and AIA seem to prefer one agency while MAA prefers separate agencies. It is not clear which way ING will go. PETALING JAYA: The dual agency concept, where conventional and takaful policies are sold by the same agents, is gaining popularity, especially among bigger insurance players, as an effective way to boost market share and deepen the penetration rate of insurance in the country. Insurance News Nor Shamsiah will replace Dato' Zamani as the new Deputy Governor. Bank Negara Malaysia wishes to announce the appointment of Puan Nor Shamsiah Mohd Yunus as Deputy Governor for a three year tenure effective 16 November 2010. Puan Nor Shamsiah takes on the position of Deputy Governor following the retirement of Dato' Zamani Abdul Ghani on the completion of his term on 15 November 2010. Insurance News The proposed acquisition of P&O by Prudential has been called off. KUALA LUMPUR: Pacific & Orient Bhd has called off the preliminary negotiations for the proposed divestment of an equity interest in Pacific & Orient Insurance Co. Bhd to Prudential Holdings Ltd.
Insurance News Has insurance industry lost its focus? Instead of selling on protection, are we now emphasising too much on investment return? Insurance veteran Captain Chia thinks so. The unhealthy trend nowadays in the industry is consumers are pursuaded at shopping malls, through SMS/internet to buy insurance for its short premium payment period and high illustrated return. Many have lost track of the fundamental of insurance which is "love and responsibility". The consequences are low persistency, lack of needs based selling and also agents shying away from customers when investment return is worse than illustrated. Insurance products should not be sold on its return. Your views? Insurance News It seems that the sale of Pacific Insurance to Fairfax Asia will need to complete by 17 April 2011. Insurance News ING will demerge its banking and insurance operations by having 2 IPOs for its insurer, one in US and one in Europe. AMSTERDAM: Dutch banking and insurance group ING yesterday said it was planning two initial public offerings for its insurance activities as part of a split of the group. Insurance News The role of the actuary will evolve in the years ahead "to deliver more robust ERM, including designing potential scenarios rather than solely performing retrospective statistical analysis", according to Aon Benfield. "Managing emerging risks is an opportunity for actuaries to add significant value to the risk management function." Aon Benfield is highlighting what it sees as the future "critical" role of actuaries in managing emerging risks for the re/insurance industry. Insurance News Takaful Malaysia will look for growth opportunities in countries like Indonesia as the competition in the local industry becomes stiffer following the issuance of 4 new takaful licences. Takaful Malaysia's Indonesian venture currently contributes 5% of the group revenue. The strategy in Indonesia for Takaful Malaysia is to focus on bancaassurance. STIFFER competition in the local takaful industry, brought on by the issuance of new takaful family licences to four new players, is driving Takaful Malaysia to look beyond the country for more growth opportunities. Insurance News SC said it has consulted the unit trust fund managers on the broad framework of PPF. Meanwhile FIMM said that SC is still working with MoF to come up with the final framework before they engage the industry and players in the market. THE Securities Commission (SC) has denied it left unit trust fund managers out in the cold on the proposed Private Pension Fund (PPF), saying that it has consulted them on the broad framework of the scheme. Insurance News The improvements in corporate governance practices and capital positions of insurance and takaful industry has been uneven between institutions and overall progress could be further accelerated. M&A would be 1 option to accelerate this. The role of signing actuaries may be expanded to support the more robust risk management particularly with respect to underwriting and solvency assessments. 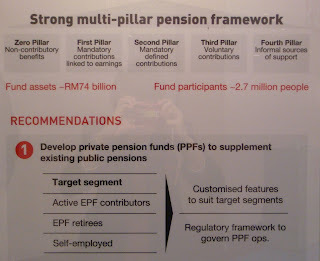 KUALA LUMPUR: Meanwhile, in the insurance and takaful industry, Zeti said there had been continued improvements in corporate governance practices and further strengthening of the capital positions of individual institutions. Insurance News Allianz wants to expand distribution channel by tapping the internet or social media networks and conducting worksite marketing with non-financial based companies, in addition to the current agency force and bancassurance channel. The new channels would bring in close to 10% of revenue over the next 3 to 5 years. KUALA LUMPUR: Allianz Malaysia Bhd will focus on two main fronts which it is confident will generate new revenue streams for the company and put it on a stronger footing in the competitive insurance landscape. Insurance News Insurance companies may be required to appoint dedicated risk heads. The role of signing actuaries is under review. BNM will issue regulatory framework for takaful by end of this year. Insurance News FIMM opines that the no. 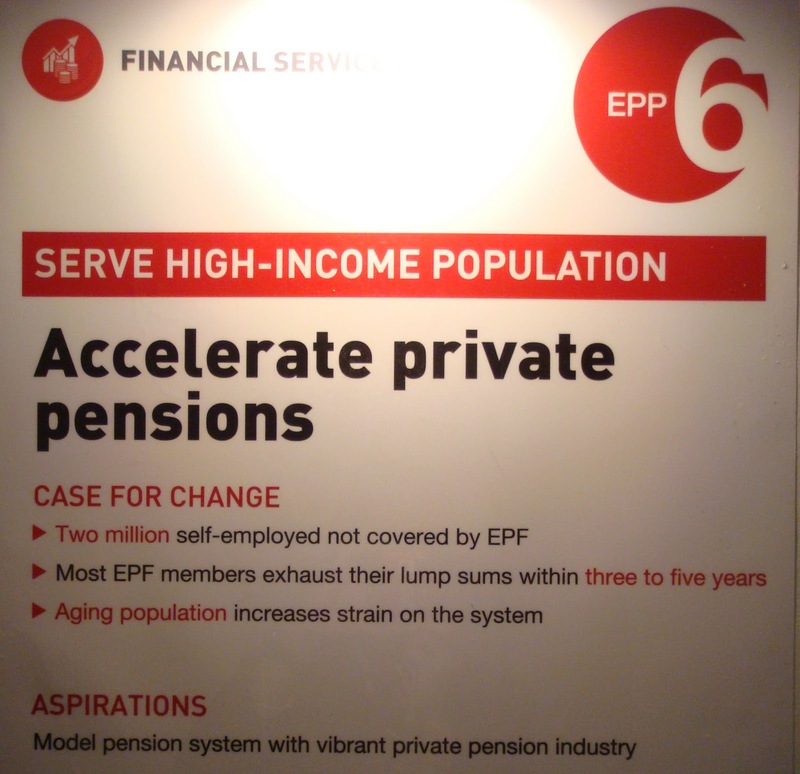 of scheme managers for the proposed private pension fund should not be limited to 5 or 6. It should be opened to unit trust companies, insurance companies and takaful operators that have got the economies of scale in managing such scheme. 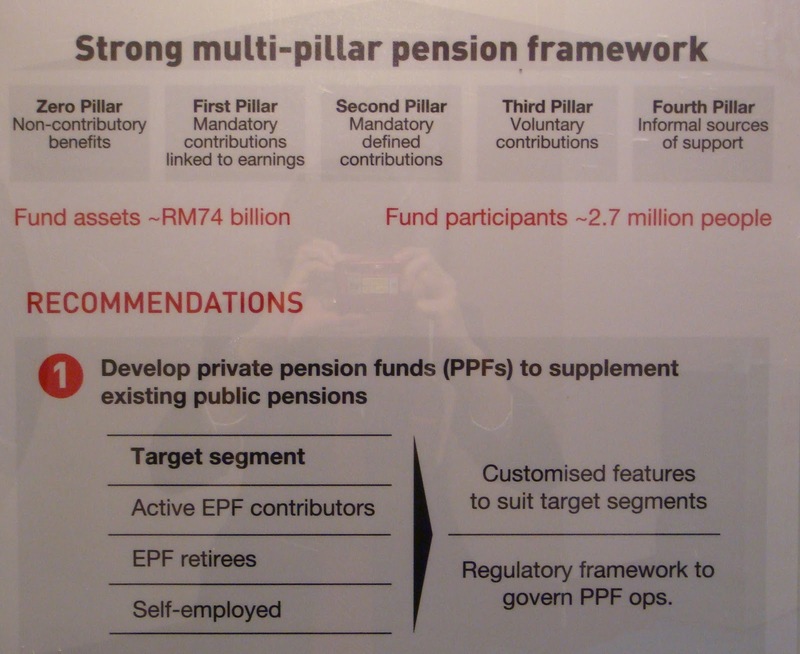 MALAYSIA'S unit trust fund managers are still in the dark about the proposed private pension scheme (PPS) but they stressed that it should be run by existing companies and not by brand new start-ups. Insurance News Zakri Mohd Khir will take over the role of CEO for Allianz General from Ng Hang Ming. Zakri was previously the non-independent and non-executive director of the parent company - Allianz Malaysia Bhd. There is no immediate news on where Ng Hang Ming is heading. PETALING JAYA: Zakri Mohd Khir is now the new chief executive officer of Allianz General Insurance Company (M) Bhd (AGIC) pending approval from Bank Negara. 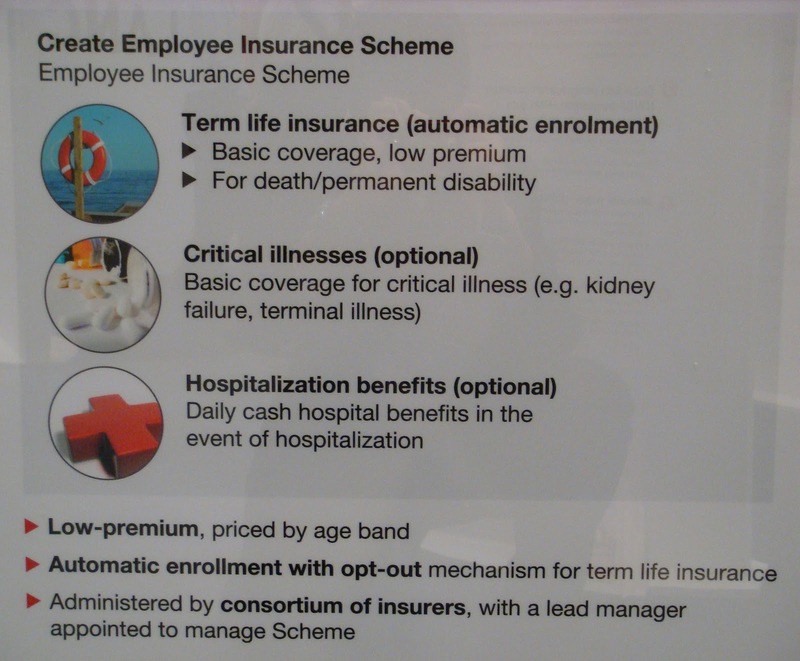 Insurance News The number of life insurance companies in Malaysia will officially reduce from 16 to 15 soon as Etiqa is reaching the final stage of merging Mayban Life to Etiqa Insurance. The number of Takaful operators will also reduce by 1 accordingly. ETIQA says it has reached the final stage of its merger process as it transfers the businesses, assets and liabilities of Mayban Life Assurance Bhd to Etiqa Insurance Bhd from today. 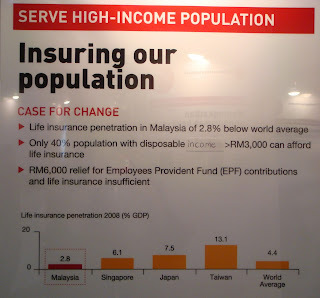 Insurance News Great Eastern Takaful's targets: a) Expand operations to Indonesia and Brunei by 2H 2011 b) Penetrate Singapore and China markets within 3-5 years c) RM1 bil contributions in the next 5 years. KUALA LUMPUR: i Great Capital Holdings Sdn Bhd (i-Great), the parent of the new joint venture (JV) takaful licensee Great Eastern Takaful Sdn Bhd, hopes to expand its Islamic insurance operations in Indonesia and Brunei by the second half of next year. 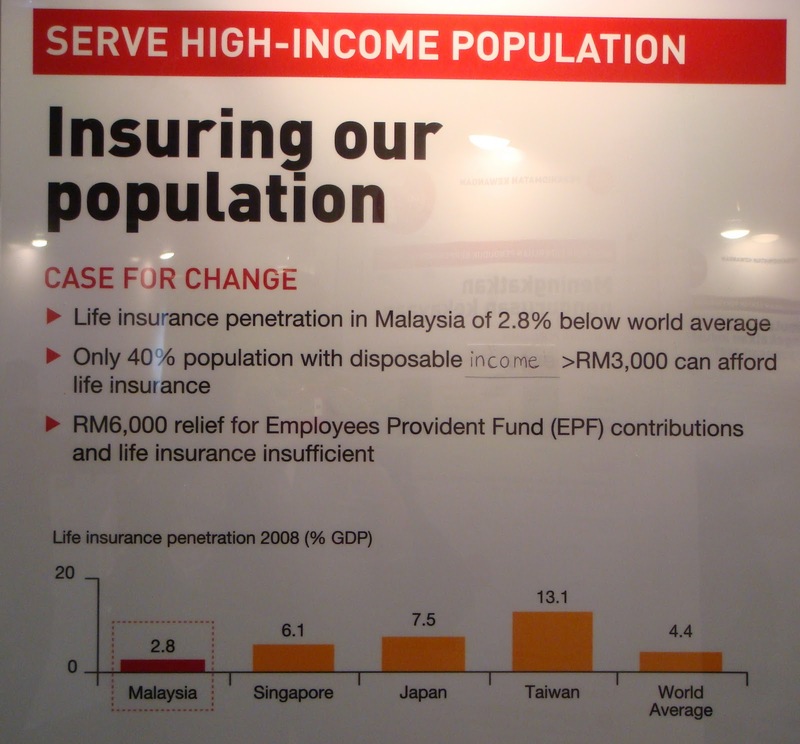 Insurance News Some highlights of Great Eastern's Q3 results: regular premium ILP in Malaysia grew 55% in 2010; CAR above 200% in Malaysia; group profit grew 15%; group weighted premium rose 12%. 27 October 2010 – Great Eastern Holdings Limited today reported Group profit attributable to shareholders of $168.6 million in Q3-10 compared to $33.6 million in the same period last year. Insurance News Takaful operators can expand fast especially in a new market by allowing their products to be white-labelled or to be the outsourcing partner of a local player in that new market. Some key success factors for proper takaful industry development include strong legal and shariah framework and mutual recognition of financial standards and products. THERE is a rising trend of outsourcing and white labelling in the takaful industry as companies seek to expand faster. Insurance News The Insurance Regulatory and Development Authority (IRDA) has banned universal life products in India. More than 500 life insurance products were banned since 2007 for being opaque or against the interest of policyholders. There are differing views on the role of appointed actuaries (AAs) in ensuring products are fair and equitable, given the different hats that AAs may wear. There are also suspicions that the product bans are not purely due to equity issue but are driven by parties who try to meet their self interests. Insurance News AIA is expected to list on HK stock exchange on 29/10/2010. HONG KONG: Troubled US insurer AIG has won approval for a Hong Kong share sale of its Asian unit, AIA, worth up to US$15 billion (RM46.4 billion), in what could be the world's second biggest stock offering this year. Insurance News Another ex-Prudential staff, Bill Lisle, has joined Mark Tucker in AIA. Bill was once the CEO of Prudential Malaysia. AIA Group Ltd. has appointed Bill Lisle, a former agency development head for Prudential Corporation Asia, as group chief distribution officer based in Kuala Lumpur. Insurance News MAA Takaful signed an agreement with LIMRA and CERT for the development and implementation of a comprehensive Shariah-compliant Leadership Development Programme. KUALA LUMPUR: MAA Takaful Bhd is expecting RM1 billion in total revenue in five years time with the strengthening of its distribution channels, says chief executive officer Salim Majid Zain. 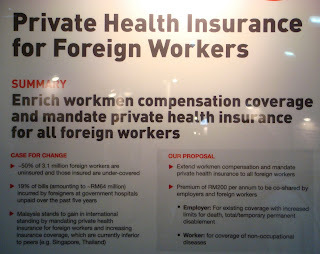 Private Health Insurance will be mandated for all foreign workers to address under insurance and to avoid unpaid bills in government hospitals. 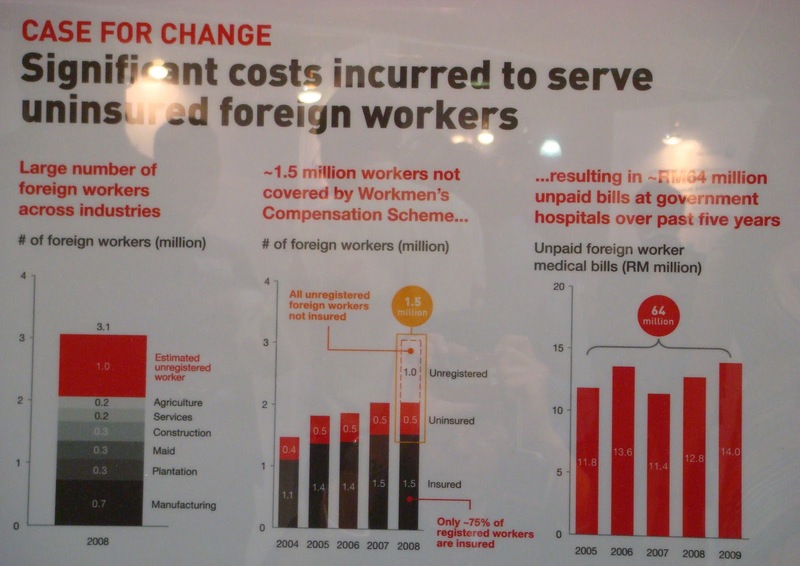 Employers and foreign workers to share premium of RM200 p.a. Coverage includes accidental death due to employment injury, disablement (total & partial, permanent & temporary), medical benefits (occupational & non-occupational). 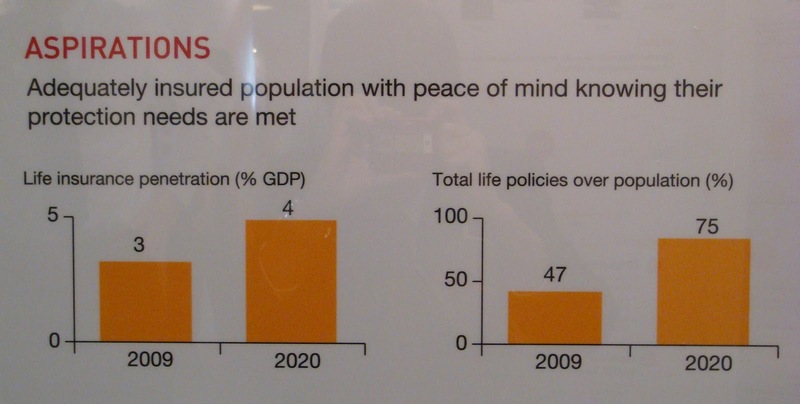 The Economic Transformation Programme (ETP) proposes to increase life insurance penetration (as % GDP) from the current 3% to 4% in 2020 and the ratio of number of life policies over population from the current 47% to 75%. 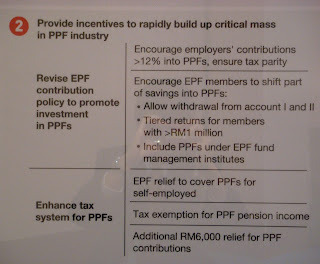 This is to be achieved by separating the current combined tax relief for EPF and insurance to RM6,000 each. 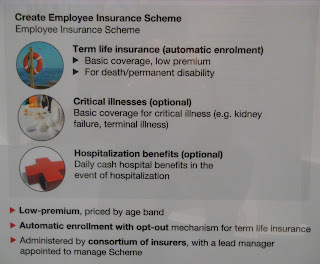 An Employee Insurance Scheme with auto term coverage will be created, CI and HB covers optional. Insurance News FSA inked an agreement with HLTMT to distribute its takaful products. FIRST Sovereign Advisory Sdn Bhd (FSA), the country's first licensed Islamic financial advisory firm, hopes to form partnerships with more takaful and financial companies over the next 12 months. Insurance News Matt Harris was appointed as CEO for Chartis effective 3 August. He was previously CEO of Chartis NZ. CHARTIS Malaysia Insurance Bhd, a property-casualty and general insurance provider, has appointed Matt Harris as chief executive officer (CEO) from August 3. Insurance News Charlie believes that Prudential has solid strategy that does not require many changes. Putting right people in critical positions is key to ensure initiatives are executed to meet objectives. On products, quality beats quantity, product launch should be of value, less can be more. He believes that Pru's competitive advantage lies in service excellence mandate for staff, leading by example policy for management and professionalism & stability of distribution channels. PRUDENTIAL Assurance Malaysia Bhd, under the stewardship of Charlie Oropeza, has been about having the right people in critical positions and adjusting its initiatives to support economic and market environment, and competition. Insurance News Heavyweight Chinese investors could potentially bid for Prudential, with the intention of offloading Pru's US and UK divisions, keeping only the flagship Asian division. Factors that may affect the potential bid include the relative pricing of AIA's IPO and whether Pru's US and UK divisions can be offloaded at an attractive price. Insurance News The confirmed buyer of Jerneh Insurance is ACE INA, for a transaction amount of RM654 mil, subject to final adjustments to transaction price to reflect book value at disposal date. Reference is made to the announcements dated 18 May 2010 that JAB and Paramount Global Assets Sdn Bhd (“PGA”), a wholly-owned subsidiary of Paramount Corporation Berhad (“PCB”), have submitted an application to Bank Negara Malaysia (“BNM”) for the approval of the Minister of Finance (“MoF”) pursuant to Section 67 of the Insurance Act 1996, to enter into an agreement with a potential buyer for the proposed disposal by JAB and PGA of their respective 80% and 20% equity interests in JIB to the said potential buyer. Insurance News PruBSN launched 3 products: PruBSN Protect (Term), PruBSN ProtectPlus (Term with increasing SA) and PruBSN CrisisCover (covers 36 CIs, optional death monthly income). KUALA LUMPUR: Prudential BSN Takaful Bhd (PruBSN) had on Monday, Sept 13 launched three insurance plans -- PruBSN Protect, PruBSN ProtectPlus and PruBSN CrisisCover. Insurance News Niosh is calling for insurance coverage to be provided to the mentally ill.
PETALING JAYA: Insurance coverage should be provided for the mentally ill, while their parents should be given income tax relief, said National Institute of Occupational Safety and Health (Niosh) chairman Tan Sri Lee Lam Thye. Insurance News Great Eastern China, which currently has its presence in Chongqing and Sichuan, is targeting a branch in Shaanxi this year and another 6 in the next 3 years. The Singapore PM visited their Chongqing head office recently. AFTER stamping its mark on western China over the last four years, Singapore's leading life insurance group Great Eastern Life now wants a greater footprint in the country by expanding across the central and eastern regions. Insurance News KATM, Great Eastern's JV partner in takaful, is no stranger to the OCBC group and in that sense to Great Eastern. OCBC owns significant share of both Great Eastern and Pacific Insurance and KATM has significant ownership in Pacific Insurance. The takaful JV may be able to capitalise on KATM's 140,000 members. The Great Eastern Life Assurance Co Ltd says its alliance with Koperasi Angkatan Tentera Malaysia Bhd (KATM) will provide access to the latter's 140,000 members nationwide. Insurance News Charlie Oropeza, the CEO of Prudential, was presented with "Outstanding Entrepreneur" award which recognises outstanding individuals for displaying entrepreneurial attributes. PRUDENTIAL Assurance Malaysia Bhd, an insurance and financial services provider, yesterday announced the award of "Outstanding Entrepreneur" given to its chief executive officer Charlie Oropeza (picture) at the Asia-Pacific Entrepreneurship Awards 2010 Malaysia. Insurance News New bancassurance product from HLA with the following features: Term Life, double SA on accidental death, refund of premiums (including extra loadings) on expiry. KUALA LUMPUR, Sept 9 (Bernama) -- Hong Leong Bank (HLB) has launched a bancassurance plan that promises customers a refund on premiums paid. Insurance News 1 more article on the issuance of 4 new takaful licences and its impact. Most of the points have been covered and reported previously. Malaysia'a takaful industry is expected to step up its performance now that an additional four operators have been issued licences to start business next year, said industry players. Insurance News OAC wants to build its agency force and brand name. The acquisition of Tahan Insurance would increase its agency force from 2,600 to more than 3,000 and strengthen its brand. PETALING JAYA: Building the agency force and brand name are two key areas Overseas Assurance Corp (M) Bhd (OACM) will bank on to strengthen its position in the insurance market with the acquisition of Tahan Insurance Malaysia’s general insurance business. Insurance News AIG has filed an application last Thursday to list AIA on the HK Stock Exchange. CIMB is 1 of the 11 bookrunners. PETALING JAYA: CIMB Group has been selected as one of the 11 bookrunners for AIA Group Ltd’s US$15bil initial public offering (IPO).